Kobe is a quaint suburban city that is akin to the relationship of Yokohama to Tokyo. It is a major city in the Kansai region and less than an hour away from Osaka. It is steeped in history but appears to suffer a little in the sense that they are always trying to step out of Osaka’s shadow. Realistically, Kobe is a city that could never rival Osaka. It is no different than asking a suburban city to be more popular than the nearby big brother. Kyoto and Nara have a similar relationship. Everyone talks about Kyoto and how great it is, yet many people overlook Nara. They are both very similar and yet they are also very different at the same time. Kobe and Osaka are similar in this respect. Osaka has grown into a very modern large city that appears to be leaving all of its history in the past. Kobe however seems to be embracing their past and expanding with the future. There is no better way to experience the past of Kobe than to explore the Kitano area. This is a small area that houses various old consulates. It is situated on at the bottom of a hill near Shin-Kobe station. Walking around the small streets in this area can make you feel as if you stepped back in time a little to when the Europeans were settling in the area and doing a lot of trade. Today, the small streets can be a little dangerous as affluent Japanese drivers zoom past you in their Mercedes Benz cars. The old European style homes can be visited for a fee in some cases, but the exteriors are very quaint. It has a very relaxing nature that makes you wish there was a nice coffee shop with a terrace so you can enjoy some afternoon tea in the sun. Kobe also feels a bit like a wedding capital of Japan. I cannot confirm this but the number of wedding chapels I saw in Kobe was astonishing. The Kitano area is no exception. There are several wedding chapels and halls in the area that will help you hold a traditional western wedding. The Kitano area is also a great starting point to do some hiking in the mountains that border Kobe. The views from the mountains are considered to be some of the best in Japan as evidenced by Mt. Rokko. Away from the Kitano area is a ropeway that brings you up to the top of Mt. Rokko which is reported to be one of the top 3 night views of Japan; the other two being in Nagasaki and Hakodate. Unfortunately on my trip I didn’t get a chance to visit the mountain peak. Central Kobe can be described as an area around Sannomiya Station. While Kobe Station is not located in this area, Sannomiya is the heart of Kobe. All around Sannomiya you will find various department stores. Almost all train lines in and around Kobe run through Sannomiya. All of the major department stores are represented in this area as well as a large and long shopping arcade that runs from Sannomiya out to the western suburbs. 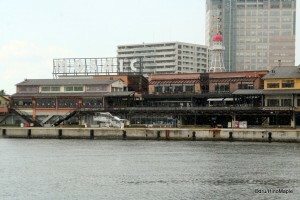 It is also the centre of all drinking to be done in Kobe. It can be difficult to get around with so many people in the area but it is a wonderfully busy place. At the main intersection, you can see all kinds of people. I would liken it to Shibuya Crossing or the east side of Shinjuku. You can see various musicians playing their music and trying break into the industry. You can also see various people looking for donations to various charities. Flower road is also a famous street that passes through Sannomiya. Flower road is a road that stretches from Shin-Kobe Station all the way to the harbour. It is a nice wide road that is lined with various flower boxes and statues. The statues can be a bit surprising for a country such as Japan since most of the statues depict naked women. Most people ignore them but for me it was a surprise. They aren’t in any sexual positions but for such a conservative country, I was nonetheless surprised. Towards the end of Sannomiya is Kobe’s Chinatown. 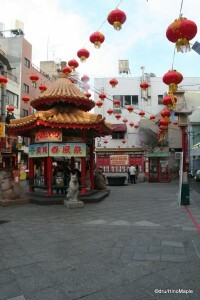 Officially called Nankinmachi (after Nanjing), it is your typical Chinatown. I actually enjoyed this one the most out of the 3 main Chinatown areas in Japan. Yokohama is the largest but it is also too busy and doesn’t feel real. Nagasaki is too small and it doesn’t feel as welcoming as Kobe. Nankinmachi is very open and very friendly. You will see many buskers selling various foods as well as many restaurants lining the area. You can’t go around the area without filling your stomach and the smells will keep you there. The port area is the last place I visited in Kobe. It is a wide area that has a lot of reminders of the past Great Hanshin Earthquake. On one end you have Mosaic and Harbourland. 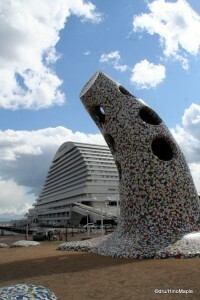 Mosaic is a modern shopping complex that is similar to the shopping complexes in Odaiba. It is an open air area with many small shops alongside some brand name shops. It is a place for couples to go and enjoy a date. It is teaming with young couples but on weekdays when everyone is working or at school, it can feel a bit like a ghost town. Harbourland is adjacent to Mosaic. It is a small urban amusement park where you can ride various amusement rides such as small roller coasters and Ferris Wheels. Across from this area is Meriken Park. This is a large open park that houses the Kobe Maritime Museum, the Kawasaki Good Times World, and the Kobe Port Tower. 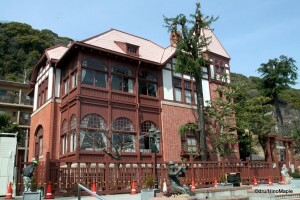 The museum and Good Times World are in the same building and showcase the history of the Port of Kobe as well as showcasing the technology of Kawasaki. Kobe Port Tower is an icon of Kobe. 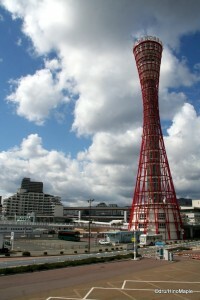 It is a tall red tower that looks similar to a baton. It is usually lit up at night but on my visit to Kobe they turned off the exterior lighting in order to conserve energy. The park itself is also used for Christmas light displays each year. 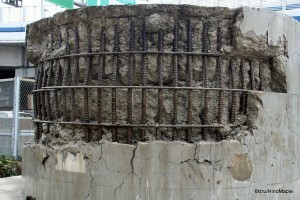 While the museum and tower are interesting, the earthquake memorial is more fascinating. At the memorial you can read about the effects of the Great Hanshin Earthquake as well as see a small section of the port that was destroyed and left as is after the quake. It was a little ironic that I would visit this section as I was taking a spontaneous vacation to escape the aftershocks from the Great Eastern Japan Earthquake. If being on solid land is starting to get boring you can also take a boat cruise that leaves from a section between Meriken Park and Mosaic. The ships embark on cruises that take you around Kobe harbour, the Akashi Bridge, or even to Kobe Airport where you can watch the planes land. One of the ships has been designed to look like a gaudy pirate ship that came straight out of a Chinese “Disneyland”. It looked cheap and a bit fake looking. It looked like a lot of fun for kids but for most adults it was probably something we wouldn’t care much for. If you head east of Meriken Park you will walk along a highway where you’ll be able to see a bit more of the earthquake history. Minatonomori Park is located in an evacuation centre that is literally nestled between elevated highways. It is a large open park that is popular for doing sports. There is a skate park for inline skaters as well as skateboarders. You can find a small hockey rink, no ice of course, as well as tennis courts and a small soccer pitch. There is a large field for you to just relax as well. Inside the park is a small monument where an old clock is preserved. It marks the moment that the earthquake struck. It is somewhat sombre but the activities in the park keep the atmosphere light. Across the way is another park that has yet another monument to the great earthquake. This monument is more hopeful as there is an eternal flame that was lit with flames gathered from all neighbourhoods that were affected by the earthquake. It is a very interesting concept and something that should be repeated in the future. For those who have even more time, heading south of this region on the Port Liner will take you to Port Island. On Port Island, you can enjoy various cultural activities. There are several different museums to visit however the cost to access the area may make people think twice. I didn’t get a chance to visit Port Island but I’d like to try on a future trip to Kobe. Overall, Kobe is a wonderful city to visit. There isn’t a lot to do but if you take your time and just relax, you will have a lot of fun. It isn’t a city where you can rush and enjoy everything. While it can be visited in a day to get a general feel of the area, I do recommend a couple days to just enjoy everything. For an average tourist, however, I doubt it would be very interesting. For residents of Japan it’s a wonderful place to get away from the big city and yet keep all of the conveniences of a big city. This entry was posted in Kansai and tagged Chinatown, Great Awaji Earthquake, Great Awaji Hanshin Earthquake, Great Hanshin Earthquake, Harbourland, Hyogo, Hyogo-ken, japan, kansai, Kawasaki Good Times World, Kitano, Kobe, Kobe Airport, Kobe Chinatown, Kobe Maritime Museum, Kobe Port Tower, Kobe Portower, Kobe-shi, Meriken, Meriken Park, Minatonomori, Minatonomori Park, Mosaic, Nanjing, Nanjing Town, Nanjingmachi, Nankin, Nankin Town, Nankinmachi, osaka, Port Island, Port Liner, Port Tower, portower, Sannomiya Station, Sannoymiya, wedding chapel by Dru. Bookmark the permalink.